Baby tulip opens her eyes and finds herself in a new pot with flowers she has never seen before, the evil roses with their prickly thorns, and the silly daisies with their simplicity... Will she ever belong? But what is it?” asked Rosalina. “I don’t know. It’s definitely not one of us, and I don’t think it’s one of them,” answered Rosetta pointing at the group of daisies on the other side. For you see, Rosetta and Rosalina were two of ten beautiful roses that lived in a huge pot with twenty daisies. The pot was placed outside a big window in Mrs. Flowerpot’s bedroom. Everyday, Mrs. Flowerpot would pop her head out the window to water her beautiful “little babies”. But about two weeks ago, Mrs. Flowerpot did something quite strange; she placed a sort of a ball between the roses and the daisies separating the kind, gentle daisies from the tough, strong roses. All the flowers in the pot were excited to know what that strange seed was, it did not look like the usual seed… it looked more like a tomato that went bad. But still, whatever it was, the daisies were glad to have it between them and the roses. For the roses were always cruel to the poor little daisies, and the daisies were frightened of their thorns. Everyday, the roses would tease the daisies, and throw thorns at them. If it weren’t for Mrs. Flowerpot always removing the thorns and the Sun always scolding the roses, all the daisies would have died. However, today, the flowers were too excited about the new seed. They just forgot about their problems and stood waiting for the new strange flower to come out. Hours and days went by until finally, one morning a rose woke up to find a tiny pink bud. “Why it’s a tulip! Of all things!” shouted the rose. All the other roses and the daisies bent down to take a closer look. “Oh look, isn’t it adorable?” said one of the daisies, “the poor thing will never survive in this weather, it gets too warm around here,” another daisy said. The tulip opened its tiny little eyes and looked up at all the flowers that were crowding around it. At that moment, Mrs. Flowerpot’s head popped out the window, “Oh look, you’ve grown!” she said happily to the tulip and gave it a little water to drink. The roses looked at each other with anger, why was Mrs. Flowerpot so excited about the tulip, it’s not that pretty. And when it grows, it will have only two leaves and no thorns. Many long days went by, the taller the tulip got, the lonelier she felt. The daisies tried to be nice and their children tried to play with the tulip but she was too tall for them. They couldn’t reach her and she couldn’t bend down to see them. 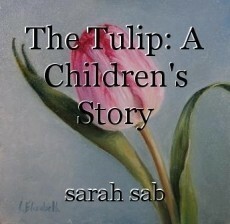 The tulip’s stem was too straight so she could only bend her head to see the daisies, but it was really uncomfortable, so eventually, the daisies stopped talking too much to the tulip. The roses on the other hand, weren’t very friendly. Secretly, every single one of the roses was jealous of the tulip. She was so beautiful and delicate and sweet, plus, Mrs. Flowerpot was always giving her special care. So whenever they had a chance, the roses would tease the tulip about being different and would throw their thorns at her. The poor tulip had no friends and no family; she did not belong anywhere. She did not look or smell like any of the other flowers and she didn’t have anything in common with any of them. The daisies were too short and she couldn’t see them or play with them. The roses were too nasty, and even if they were nice to her, she wouldn’t belong with them either. She was different, and no matter how hard she tried to look or act like them, she never could. She was a tulip, and she was on her own. The only one that was kind to her, was the sun. Every morning, Mr. Sun would send a gentle ray of sunlight to wake up the tulip. He was like a father to her. He told her stories of the people and things from all around the world. She knew about the Taj Mahal in India, the Eiffel Tower in France, and the way people dressed in Japan. He told her stories of the ancient times, about pharaohs and the princes and the princesses and about cars and ships… he told her secrets and jokes. From dawn until dusk, Mr. Sun and the tulip, would share happy moments together. They loved each other like father and daughter and that always gave the tulip hope and happiness, he helped her out of her loneliness. Now summer was coming to an end, and the tulip was starting to see less of Mr. Sun, which really scared her. Mr. Sun assured her that he was still there but only she couldn’t see him because the clouds covered him. But whenever he heard her crying, he would send her a warm ray of light through the clouds. Then she would feel all right and know that he hadn’t left her. But strange things were happening, all the other plants were starting to dry out and disappear, even the daisies and the roses. Where were they all going? And why were their friends and families crying? One day a huge storm hit the town where Mrs. Flowerpot lived, and Mrs. Flowerpot quickly covered her flowers to protect them from the wind and the rain. The roses closed their leaves and hugged each other, and the daisies bent down and huddled each other for protection. But the tulip was all alone, she had no one to hug and protect and Mr. Sun was no where to be seen. The tulip’s tears started to slide down her pretty petals. She was so sad, and so weak. Then suddenly she felt a gentle ray of light on her petal. She looked up and saw Mr. Sun, he was back, he came back for her! She was now very happy but she still felt weak, she closed her petals and went to sleep, the ray still keeping her warm. The next day, Mrs. Flowerpot’s anxious face popped out the window. The tulip did not wake up this morning; the weather was too harsh on her. Mrs. Flowerpot removed the tulip from the pot of daisies and roses, and put her bulb in another pot, hoping she would survive. Mr. Sun took good care of the bulb and the following spring, a new pink bud came out, she opened her eyes and saw strange looking flowers around her. They were all the same shape but different colors. “Welcome back”, said the sun. She smiled. “Look around you,” he said. She looked around at all the flowers, they were different than the ones she had lived with before, but they seemed very familiar. © Copyright 2019 sarah sab. All rights reserved.